Well, it is Sunday and today we paid the price for taking yesterday off! This morning we got up early and ran our errands. We did our Einstein's bagel breakfast run and then on to Costco. Afterwards we went to both Publix and Kroger to do our grocery shopping. All the kids (girlfriend included) are coming for dinner this evening. I made a big pot of home made Italian meat sauce when I got home from the store loaded with ground beef, Italian sausage, and all kinds of fresh summer veggies. I simmered it on the stove for about an hour and then transferred it to my crockpot where it continued to simmer for another 4-5 hours on low. Moving it to the crockpot helps keep the kitchen cool in this summer heat. All I have to do is put the pasta on to boil shortly before dinner and pop my Easy Cheesy Bread in the oven and dinner will be ready quickly. 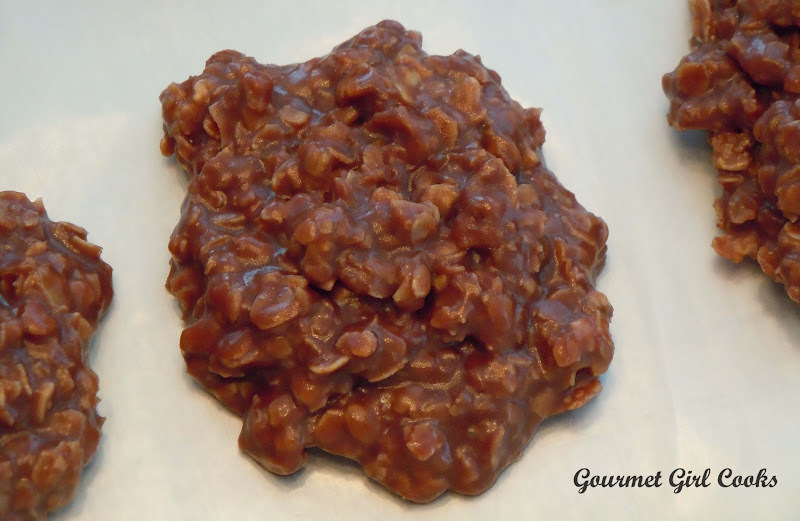 For dessert I made a batch of "No-Bake Chocolate-Peanut Butter-Oatmeal Cookies". 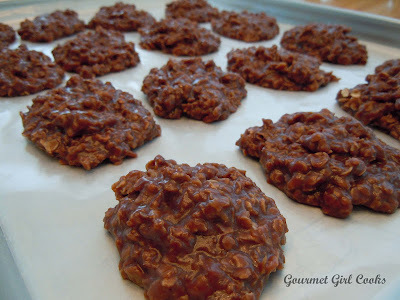 They are the "perfect cookie" to make during the dog days of summer. They are quick, easy and delicious. I remember having these cookies back when I was a little kid in elementary school (and that is a long time ago). They were called "Raggedy Robbins" and my school cafeteria usually served them on Fridays for some reason. That was really the only reason to buy lunch that day...to have Raggedy Robbins. I have heard them called many other things over the years...but for me, they will ALWAYS be known as Raggedy Robbins. I've included the recipe for both my meat sauce and Raggedy Robbins below as well as a few pictures. Enjoy! In a large, heavy stockpot, brown Italian sausage and beef, breaking up as you stir, drain fat. If necessary, add olive oil to continue cooking the additional veggies with the meat. To your pot of browned meat mixture, add onions, red bell pepper and carrots; continue to cook, stirring occasionally until onions, carrots and peppers begin to soften. Add garlic, zucchini and squash; cook until slightly softened. Add tomatoes, tomato paste, tomato sauce and water. Add oregano, basil, parsley, brown sugar, crushed red pepper, and black pepper. Cover; simmer on low, stirring occasionally for about an hour; longer if desired (I transferred mine to my crockpot after an hour on the stove and let it continue to cook on low for several more hours). 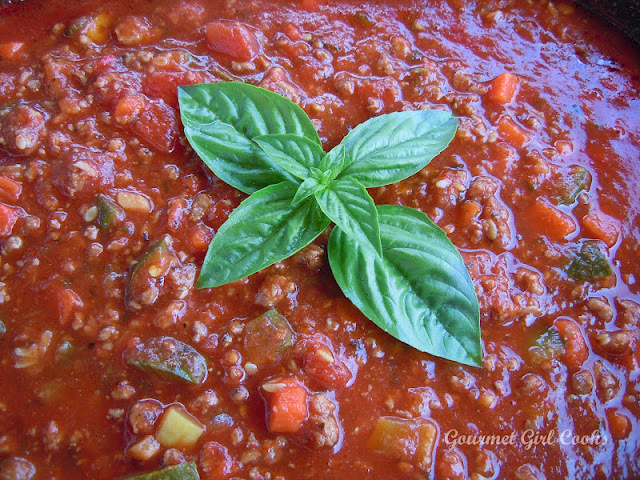 Ladle sauce over drained pasta and sprinkle with Parmesan cheese and fresh basil or parsley before serving. Enjoy! Note: The addition of red wine is entirely optional and could easily be left out. I used lean ground beef along with Italian turkey sausage to reduce the fat. 1. Add the first four ingredients (through the cocoa powder) to a 4-quart saucepan. 4. Stir in the peanut butter and vanilla until smooth, then stir in the oats (if it seems too runny you can stir in additional oats, a couple tablespoons at a time). 6. Let cool until set (to speed up setting, place them in the refrigerator).